To many observers watching the visit to Britain by Pope Benedict XVI in 2010 one of the most moving moments was the Holy Father’s speech to 4,000 schoolchildren gathered in St Mary’s University College, Twickenham, south west London, in which he urged them to be the “future saints of the 21st century”. Though very few people are considered holy enough to be raised to the altars, the Pope was nevertheless proposing a realistic prospect because with every generation God raises new saints, people of true holiness who love God to such an extent that they manifest one or more of the virtues heroically. The saints are proposed by the Church as models of Christian life and by following their example the faithful can deepen their own relationship with God. Because of their closeness to God, the prayers of the saints are also powerful, which is why some of them are named as patrons and why so many Catholics ask them in prayer to intercede for them in the difficulties they face in daily life. Generally speaking, there are two kinds of saints: confessors and martyrs. At present the Church seeks two healing miracles as a supernatural sign that a person is a saint, or one in the case of proven martyrdom. Candidates for sainthood are first declared Blessed either after a first miracle has been accepted by the Church or their martyrdom – that they died because of their faith alone – is established. Canonisation is the conclusive step and it requires proof of a miracle. At this point the Pope will pronounce with infallible certainty that sainthood is recognised. The Diocese of Shrewsbury is associated with more than a dozen canonised and beatified saints and martyrs. They date from the Anglo-Saxon period of St Chad, St Werburgh, St Winefride and St Oswald and extend into the Medieval period of St Thomas of Hereford. The 16th century, the Early Modern Age of the Tudors, produced eight martyrs associated with the areas now covered by the Shrewsbury diocese. All of these were executed for treason during the frenzy of persecution that convulsed the country in the mid-Elizabethan period when it became a capital offence to celebrate Mass or harbour priests. One of them, St Margaret Ward, was born in Congleton, Cheshire, and was among the 40 martyrs of England and Wales canonised by Pope Paul VI in 1970. A ninth martyr, St John Plessington, executed in Chester in 1679 amid in the hysteria of the fabricated “Popish Plot” of Titus Oates, was also canonised at the same time. Following Catholic emancipation in the 19th century there is every chance that the Church in England and Wales will one day be able to venerate a new generation of post-Reformation era saints, among the most prominent of whom is the Blessed John Henry Newman, who was beatified by Pope Benedict in Cofton Park, Birmingham, on 19th September 2010. Certainly, in his Second Spring homily, given at St Mary’s College, Oscott, Birmingham, in 1852, Blessed John Henry himself expressed the hope that Shrewsbury would be among those dioceses that will give glory to God through the witness and example of its faithful. In the meantime, we can draw courage and consolation from the prayers of the inspirational men and women who already form the saints and martyrs of the Diocese of Shrewsbury. 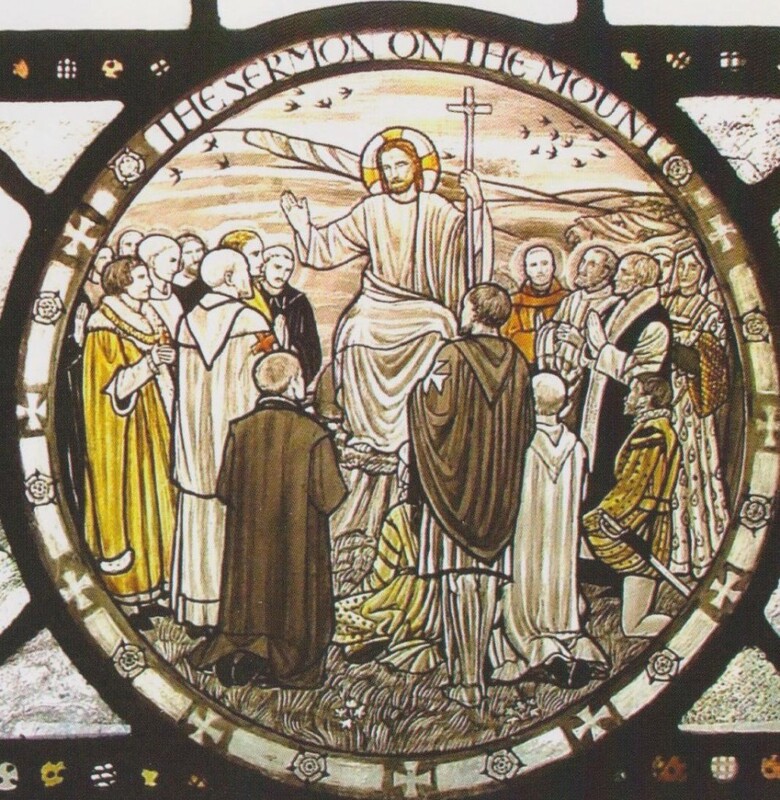 The above image by Margaret Agnes Rope has been provided courtesy of the Nuns of Tyburn Convent, London. Rope, who was born in Shrewsbury in 1882, converted to the Catholic faith from Anglicanism before she became a Carmelite nun, taking the name Sister Margaret of the Mother of God. Many of her finest stained glass windows can be seen in the Cathedral of Our Lady Help of Christians and St Peter of Alcantara, Shrewsbury, and in the Crypt of the Martyrs in Tyburn Convent.